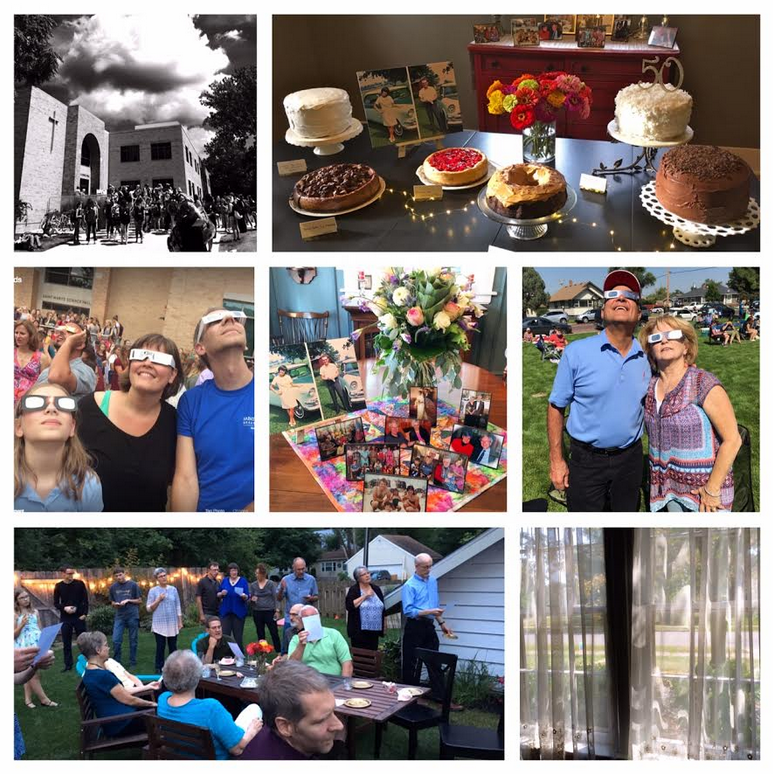 This past week began with an auspicious solar display, described by one commentator as the “first coast-to-coast eclipse in a century,” and ended with a slightly early celebration of our 50th wedding anniversary, the latter (though perhaps no excuse) the reason why today’s blog is posting later than usual. The rituals of observing these two rare occasions, particularly in the same week, seem somehow related. Eclipse “fervor points to an innate human tendency to respond with anticipation—and a mix of fear and fascination—to what is truly awe-inspiring. What underlies this response is our deep human need to practice reverence, to demonstrate honor and respect for something that extends beyond our powers and finiteness,” according to Stephanie Ludwig in a MindBodyGreen post on August 18. Ludwig goes on to say that “the brilliant American writer Annie Dillard published a captivating essay titled “Total Eclipse” in her 1982 book Teaching a Stone to Talk. It is a profoundly spiritual, even mystical, description of her experience of a 1979 solar eclipse. Consider how you might express your experience of the eclipse creatively. You might journal or blog about it. Write a poem, paint it, draw it, dance it,” the author exudes. Staying abreast of the steady cascade of eclipse information before the solar event, including this National Public Radio clip of music to enjoy during the eclipse and these ruminations posted in The Mennonite (called Mennos dancing with the stars as sung to Will you let me be), provided advance preparation as well for the solemn ritual of embracing 50 years of marriage with family and friends during the last five days. By both default and design, our anniversary party ritualized some of what happened at our wedding as we sang together Be thou my vision which our wedding guests sang with us back in 1967 and which our daughter and son-in-law's guests sang 15 years ago at their wedding. As we brought together for the party folks who attended our wedding as well as others whom we have met since then, we acknowledged the importance of our rootedness in community. In a serendipitous happenstance, daughter Meg displayed some of the cakes she made for the 50-year observance on a pedestal cake stand given her and Jeff at their wedding 15 years ago, a footed cake stand we received 50 years ago, and two flat cake plates with matching ceramic servers that were gifts to my parents 72 years ago, underlining our reliance on the support and role modeling one generation offers the next. “Both coming from families that knew how to laugh together, we have cultivated the fine art of ribbing one another. He laughs at my logistical shortcomings (ask him about my first drive alone after getting my license at 21 or about my skills with gardening tools); he gets teased in return for his naivete about popular culture,” the newsletter article observed at the 40-year juncture. Ludwig offers this invitation at the close of her MindBodyGreen essay: “May embracing the eclipse invite us to rediscover reverence in ways that resonate with our own deepest experiences.” Somehow that advice seems relevant to the celebration of a long-term marriage as well. Where do we find ourselves at 50 years or 40 years or 30 years? At even 20 or 15 or 10 or 5? No matter the length of your marriage (or some other long-time endeavor), take a moment to experience where you are on that journey and where you have been; dare to look ahead to where the adventure might take you in the future.